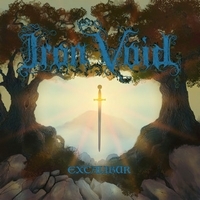 British Iron Void are back with their 3rd album, called Excalibur. You guess it, the conceptual album is about King Arthur and his legendary sword Excalibur. The band was initially founded in 1998 by Jonathan 'Sealey' Seale and disbanded in 2000. In 2008 Sealey re-united to bring back 80's doom metal. The trio kicks off with Dragon's Breath. Spoken Words lead into the tune, its like you listen to a magician who tries to conjure up something. The band sets in and takes you into their doom metal universe. At The Coming Of A King they head into a mid-paced heavy metal tune with doomish elements. Think early 80's Dio with doomy guitars. Steve Wilson's guitar is adding melodic leads and create a certain catchiness. Acoustic guitar leads into the closer Avalon, vocals set in and a slow tune develops. Actually they stay at the opening theme and so this is almost a singer / songwriter kind of tune. If you like 80's doom metal with clean vocals, you should give Iron Void the chance to convince you!